The house I live in is small, whether it is the living room or the bedroom, the depth of the landscape is more than 3 meters. I always wanted to buy a projector, subject to the limitations of the indoor space, it is not easy to present a large screen projection effect, even the home TV is only a 43-inch small screen TV. So, I bought a Projector at the Gearbest mall: AAO S1 DLP Smart Business Home Mini Projector. – DLP technology Works faster than the LCD display, reduces heat, high contrast and minimizes gaps between pixels, which leads to unification and better image quality. – Built – in speakers. Usually inches from 80 to 120 inches screen Provides a clear widescreen screen for home theater. – Features with DLP technology, can project a clear image without causing the same optical damage as TVs, laptops and tablets. – This technology saves your eyes, allowing you to enjoy movies, sports, TV. Image size can be adjusted only by changing the distance. – Small size and light weight. 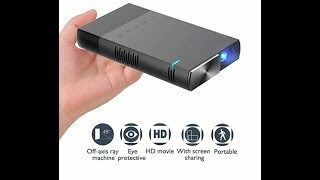 From this mobile projector it is convenient to work at home and in the office or while traveling. – HDMI: You can use the HDMI cable to contact the computer with the projector and share your computer on the big screen of the projector. – 5200 mAh rechargeable battery: Battery capacity reaches 5200 mAh, after fully charged, it can support about 2 hours of use. – Over 30,000 hours of life : Keeps you away from changing the lamp all the time. As an entry-level projector, AAO S1 still has certain advantages in terms of function setting, handling and cost performance. Due to insufficient brightness, the projection quality is easily interfered by external light, but in a darker environment, it can still show good visual effects; the physical resolution of 854*480 is somewhat unsightly, supporting 1080P compatible resolution, picture The quality is generally clear, although it can’t reach the projection effect of 1080P level, it is also acceptable to watch movies and TV dramas every day.